San Diego is the best Halloween city in the United States. The perfect October weather allows everyone to celebrate both indoors and outdoors, while our friends in Northern California and on the East Coast are already starting to freeze in the autumn and winter weather conditions there. 1. Wear a costume. Really. 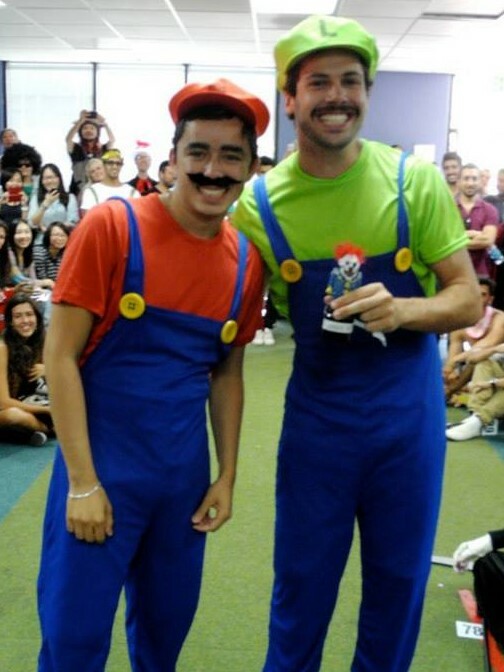 Dressing up in a funny costume may seem embarrassing at first, but I have surveyed hundreds of students in my time as a teacher. Students who wear costumes have a lot of fun and they tell all of their friends back home about all of the Halloween good times they experienced. Students who don’t wear costumes frequently regret it after Halloween is over. Believe me. Costumes don’t have to cost a lot of money and don’t have to be complicated. There are a lot of options that are not embarrassing at all, but are still a lot of fun. For example, a baseball player could be a great costume that’s not embarrassing, not complicated, not expensive, and totally comfortable. Here’s a good little list of costume shops and Halloween stores in San Diego. 2. Decide early which events you’d like to visit. *These events will be updated regularly, so visit this page again for more information, dates and locations. 3. House parties are good, but officially sanctioned events are safer and are still a lot of fun. Organized events around town have security staff and are properly planned so that they can accommodate large numbers of people. If you go to a house party, be prepared for long bathroom lines and the possibility of the police arriving and telling everyone to leave. Most organized events are pretty centrally located, too. This means that they’re easy to reach by public transit, taxis/Ubers/Lyfts are easier to find afterward. 4. Organize your transportation plans early. Make sure you have a designated driver or a bus/trolley/taxi plan. Do not drink and drive (ever!). There are so many people walking around town, and so many police. Don’t take your chances. It’s too easy to hurt yourself, your friends, or even strangers if you decide to drink and drive. There are plenty of safe ways to get around on Halloween if you plan just a little bit. Talk with your friends and decide who will be the sober driver, or plan with them to use San Diego MTS services to reach your destination. Also, research the schedules of buses and trolleys because the schedule changes after midnight on most days for many routes. Many parties in Downtown San Diego offer special admission deals that include discounted hotel rooms nearby so that you don’t have to worry about returning to your house after their Halloween party. 5. Keep a few ride service telephone numbers in your phone. On the nights when people go out to celebrate Halloween, transportation systems get pretty busy. Getting a ride to or from your party can take a long time, especially later into the evenings. If you have two or three taxi and rideshare apps in your phone, you will have a much easier time getting around and getting home safely after the parties and events. Download all of these apps onto your phone now, and input your payment information. 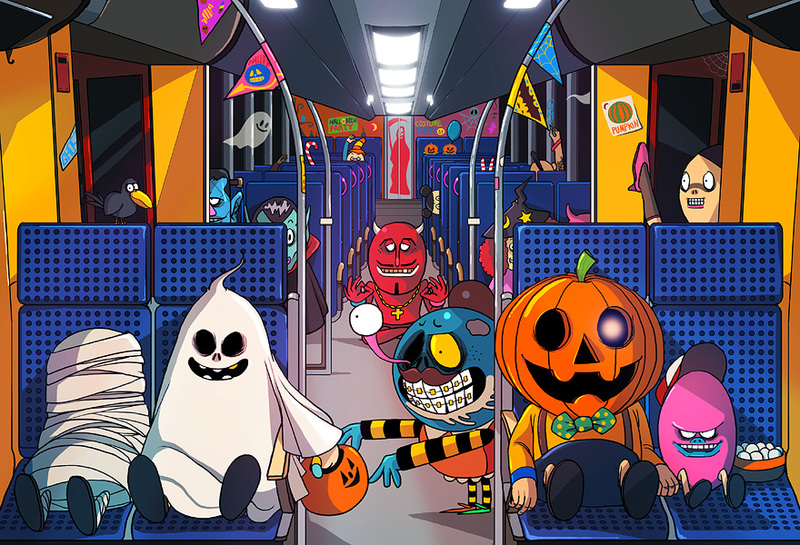 This way your transportation will not be a nightmare when you’re out having Halloween fun! 6. Don’t wear costumes with masks. Do you like to eat? Do you like to drink? Do you like to talk? Do you like to see? Do you like to breathe? Imagine how difficult all of these things are when you have a mask covering your face. It’s especially sad when the mask really completes the costume, but the person has to keep the mask pulled up over the top of their head most of the time so that they can breathe. You may find some excellent-looking masks at the Halloween store, but believe me: you’ll regret choosing them. 7. Don’t choose a costume that has big fake props. 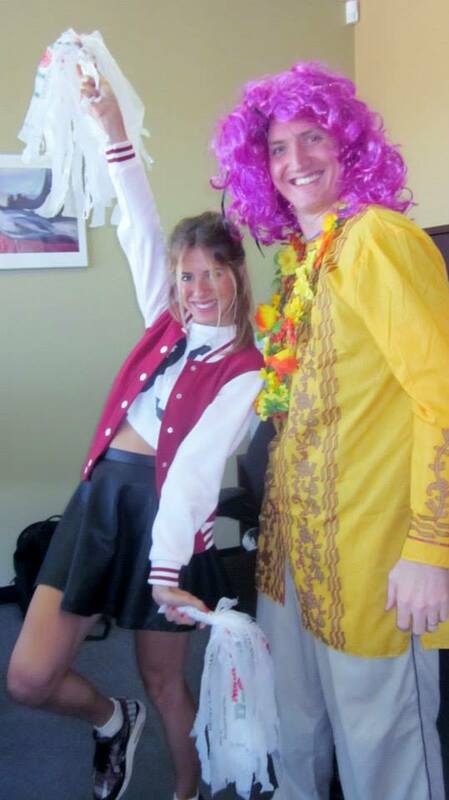 Most people spend their Halloween walking, dancing, giving high-fives and sometimes holding beverages. All of these things are a lot harder to do when you have to carry around a fake knife, a rubber chicken, a fruit basket, or some big, heavy parts of your costume. Anything that makes it difficult to walk or stand is also a bad idea. Here is one good example of a costume that is probably not very smart. Can you see why? And can you imagine walking around with all this stuff all night? Forget it. 8. Wear costumes with wigs, makeup, funny hats, pockets, etc. instead. All of these things make your Halloween much more fun and manageable than if you wear a bad costume with a mask or fake weapons and toys that you have to carry around all weekend (#s 6 and 7 above). A purse or a backpack is always a great idea for you or one of your friends to have as well. This way you can keep your wallet, your ID, your credit or debit cards, your camera (see #9 below) and your cell phone secure. Can you imagine trying to carry all of those things around while wearing this tiny costume? Be prepared for event security guards to search your purse or backpack, though. Remember, Halloween is fun because you can talk and walk and laugh with good people. If your costume makes these things difficult, you will not have as much fun. Wear a costume that is light and flexible, not heavy and cumbersome. 9. Bring a camera, of course! You are definitely going to want to take pictures of the events you’ll attend, the costumes you’ll see, the people you’ll meet, and the hilarious things you and your friends will do. Want to see some pictures of regular people having tons of fun on Halloween? 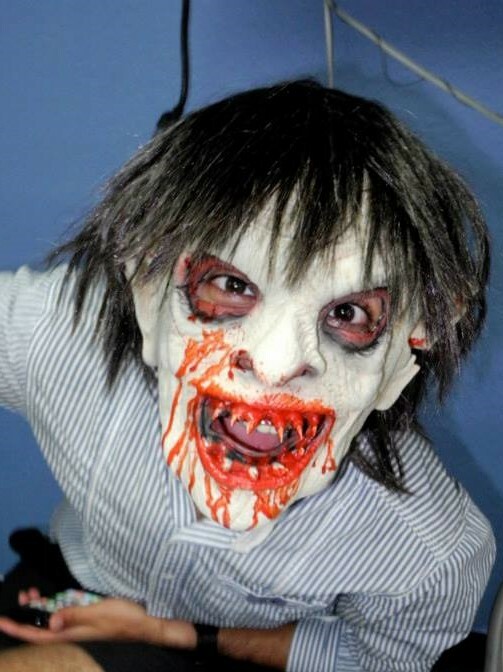 Here is a website full of Halloween photo albums from all around San Diego. Imagine how jealous your friends back home will be when they see how fantastic your experience in San Diego has been, and the culture that you have experienced as you learn English. You will want to remember Halloween in San Diego forever. If you have the chance to carve pumpkins, do it! You’ll have a lot of fun. Pumpkins can be bought at your local Vons, Ralphs or Albertsons any time in the month of October. 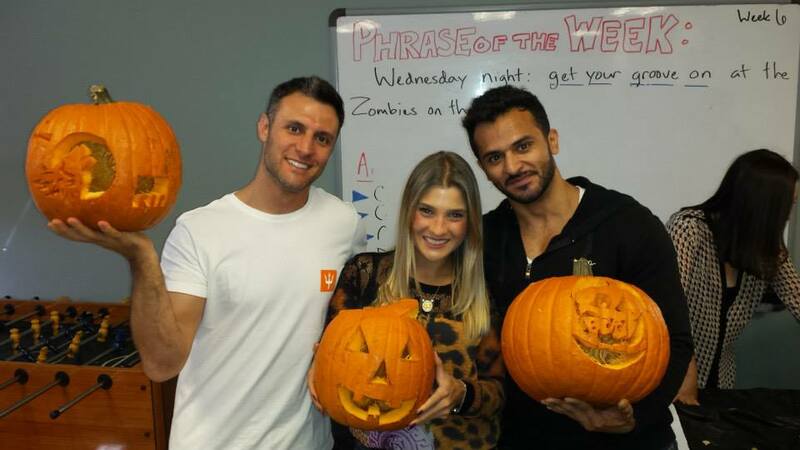 Connect English will have a pumpkin carving event/contest later this month, so keep your eyes open. You will never forget it! Last year’s pumpkin-carving day at Connect English [YouTube] was a fresh and educational experience for all of our students. Pumpkin pie is amazing. Starbucks pumpkin spice lattes are delicious. Pumpkin bread, pumpkin soup, pumpkin beer, pumpkin ice cream, and just plain pumpkin seeds are seasonal foods that you’ll remember for a long time. But you won’t remember them if you’re afraid to try them, and many of them are not available once October ends. You can’t afford to wait! 12. Be adventurous. Don’t be afraid of the fun! Participate in the student activities that your school offers. They’ll help you understand and become more comfortable with how to celebrate Halloween in the USA. It is understandable that international students are a little bit uncertain about this unique season in the USA. But don’t let your uncertainty ruin your opportunity to have one of the best experiences of your life. Ask a teacher, a roommate or any American friend about Halloween and we will be happy to tell you more. I promise! 13. Join Connect English Activities! If you are in a school that is not offering many fun activities for Halloween, join Connect English! The whole month of October (“CONNECTober”) is full of activities with costumes, pumpkins, food, friends and fun. Check out our CONNECTober calendar here to see the dates, times and locations of activities this year. Check out our Facebook photo albums from parties past. And contact Connect English if you want to be part of the San Diego language school that students enjoy the most at Halloween, and throughout the year!